Women in the Scriptures: Test Your Knoweldge and Win a Prize! After my interview with Diana Webb, the author of "Forgotten Women of God" she was so good to offer to give away a copy of her book to one of my lucky readers! If you missed my interview with her make sure you go back and read it. She has beautiful insights into women in the scriptures. There are three ways to enter the give away. 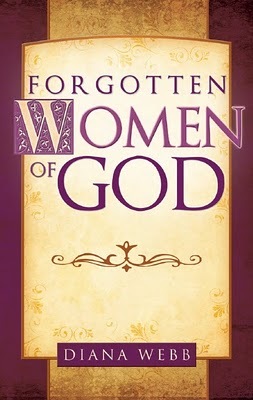 1) Take the quiz on women in the scriptures (written by Diana Webb) that is posted below. If you get 1- 5 questions right you get 1 entry. If you get 6- 11 right you get 2 entries and if you get 12- 17 right you get 3 entries. 2) "Like" Diana Webb's facebook page. 3) Link to my interview with Diana on either your blog, facebook or twitter. Please let me know which ones you do. Here is is the quiz. There are two rules. 1) You may NOT use google or any other outside source to find answers and 2) please be honest. Good Luck. I will post the answers in the first comment. 1. What was the name of the wife of Joseph of Egypt given to him by Pharaoh as a reward for interpreting his dream? 2. From the Apocrypha: Who saved her Jewish people by beheading the formidable general of the Assyrian armies in his sleep? 4. Who hammered a tent peg into the temple of the sleeping Canaanite general Sisera after giving him warm goat’s milk? 5. Who was sacrificed by her father, a General of the Israelite armies, after he made a rash vow promising God that if he would make him victorious in battle, he would offer, as a sacrifice, the first thing that met him when he returned home victorious? 6. Who prayed for a child in the Tabernacle at Shiloh and promised God she would dedicate him to the Lord if only God would grant her petition? 7. Who dressed up as a sacred prostitute in order to raise up seed to her dead husband? 8. Which woman performed the circumcision of her son herself, in order to save her husband from being killed by the Lord? 9. Who strategically arranged for her abandoned brother to be nursed by his own Hebrew mother instead of in Pharaoh’s court where he was adopted? 10. Who hid her newborn son for three months in order to prevent him from being slaughtered by Pharaoh’s soldiers? 11. Who defied Pharaoh’s dict to kill all newborn male babies at the peril of their own lives? 12. Who rescued a condemned Hebrew baby boy from the waters of the Nile? 13. From the Apocrypha: Who maintained her integrity even though she knew that she would be condemned to death after two respected Jewish elders threatened to blackmail her if she would not let them seduce her after they discovered her bathing in her private garden? 14. Who, like Mary, had the birth of her son announced to her by an angel? 15. Who sold her hair to the devil, disguised as a bread seller, in order to feed her suffering husband? 16. Which woman, purported to be the daughter-in-law of Noah, is portrayed on the ceiling of the Sistine Chapel, but is not found in the Bible? 17. Which woman gave God a name – “The God That Sees Me” and was the mother of Abraham’s firstborn son? Good Luck, hope you win! I will close the give away on April 1st. Okay here are the answers! Can't wait to hear how you did! I only got 9 questions right - and a couple of those were only because I had read the interview yesterday! OOh wow, that was hard but very interesting! I got four and shared on facebook. I didn't read the interview first. Suppose I should have. =o) Thanks for the chance! I got 8 questions right. I'm excited to read this book! I got 8 right! Thanks for all your hard work to produce such an inspiring blog! I got 6 right... some of them were on the tip of my tongue but I couldn't remember their names! I got seven--some I knew the stories of but wither hadn't known the name or just couldn't recall! What a fun quiz! Thanks so much! I got nine. Those were very hard and intriging questions. What a fun quiz! I really want to read this book so I can get 100% next time! I will try to do the test a little later but I "like" her facebook page. Thanks!